Even by 2013 standards, the DPS Lotus 138 is unique, and deserves a little more backstory than most skis. DPS does a good job explaining the inspiration for its design, from Stephen Drake’s first experiments with tip rocker, to his collaboration with Peter Turner—who was also involved with the development of the Volant Spatula, the first production ski that employed rocker and reverse sidecut. The basic idea is that powder snow is a completely different medium than the inbounds / hard snow for which sidecut and traditional camber were designed. “Reversing” the sidecut—bringing the wide point of the ski underfoot—and combining that with tip and tail rocker allows for better floatation, more maneuverability, and a decreased tendency for the ski tips to hook when drifting across the fall line. It also concentrates mass toward the center of the ski, thereby lowering the swing weight. I’ve been skiing a lot on reverse sidecut / rocker skis since 2006-2007, and have been on versions of the Lotus 138 since 2009. I wouldn’t say that skiing them is an “entirely new sport,” but there’s almost nothing in the world I enjoy more than riding deep powder on the Lotus 138. And I’ve also been pleasantly surprised by how versatile the 138 has proven to be. The Lotus 138 Pure will be updated for this coming season as the Lotus 138 Spoon. Based on the 13/14 catalog, the profile will change slightly to 143-138-140 versus the current 140-138-139, and there will be a “spooned,” or convex, portion of base at the front of the ski. The “Pure Carbon” version will also be updated with “Pure3” construction. (See Jonathan Ellsworth’s DPS Wailer 112RPC, Pure3 review for more details). The Hybrid (fiberglass/carbon/bamboo) version of the Lotus 138 will keep the same shape as the current 138. We will be reviewing the Lotus 138 Spoon this coming season, but we wanted to get a review up of the non-spooned version that’s been around in various iterations for quite a while. This is a ski designed to be an uncompromising powder tool. I’ve been fortunate to spend a lot of time riding it in its intended conditions, and I think it deserves to have a more nuanced evaluation. I’ve found that the ski behaves differently depending on how steep you’re riding, so I’ll break it down into two broad categories. Skied neutrally, however, the Lotus 138 is super loose and fun, and direction change is as easy as I’ve experienced. They don’t have the ability to pop and ollie as easily because of the stiff flex and continuous rocker like some more traditional pow skis I’ve ridden recently (Salomon Rocker2, Rossignol Squad 7), but they are super playful and fun in featured, forested, or pillowed terrain like I found in Japan this past season. Steep powder: Almost all modern powder skis are super fun in steep, soft snow, but I haven’t been on another ski that equals the Lotus 138 on the best of days. All turn shapes—fast or slow, big and open, or tight and technical—there’s no other ski I’d rather be on. Aside from the shape, the DPS Lotus 138 differs from these other skis in two ways. The first is the energy you can generate in highly angulated carved turns. Where the Powderboard feels damp, the Lotus 138 feels powerful and reactive. Especially in maritime pow, I could lock into a turn almost like a race ski on a groomer and use the stiff flex to propel me into the next turn. The second unique aspect of the Lotus 138 is the light weight. When getting into more technical terrain like narrow spines or peppery / cliffy lines, the low swing weight facilitates quick moves and enables the skier to carry more speed with confidence. It would be interesting to hear comments/do a test on the PM Lahasa Pow in the context of similar skis. I’ve never seen a peep out of you guys. Is there a personality conflict? I must say that your reports are the best in the biz.– Actually the only reports/reviews in the biz worth reading! Hi, Richard – from a design standpoint, the Lhasa Pow and the Lotus 138 have very little in common, other than they’re both pow skis, of course. But we were supposed to review several skis from PM Gear to review this past winter, but we never received them. So perhaps this coming season? Hi Richard, Thanks for reading and for the kind words. I have no experience at all with PM Gear skis and have never even held a pair in my hands. I have an open mind to all of the ski makers out there and would be excited to give anything a try. I’ve a pair of 186 Lahasa’s that I acquired used & put about 30 days on. Ultra-light for the size of the ski, and a step up from my old Watea 101’s and the DP112’s i demoed. But there are so many different constructions and shapes out there now that my limited sample gives little basis for comparison. I like the combination of a relatively stiff ski with a early rise bullet nose for charging through crap, and the semi-pintail and light weight makes it very maneuverable in tight trees and deep pow. Paul, nice review. I would like to see a detailed comparison to the Praxis PB and the 138 if you ever find the time. Thanks for this one! Thanks Dane! I did my best to provide comparison with the Powder Board in this review but I’m happy to answer any questions you have based on my time on the skis. Is there anything in particular you were wondering about? Would the Lotus 138’s work well for tree skiing in areas like Niseko, Japan? What other DPS ski would work well for the Niseko trees? Also, can you recommend a Japanese resort that has accessible and plentiful bowl type skiing? Hi Clay, the Lotus 138 would be my first choice for a trip to Japan and it was, indeed, the ski I took last year. I have never been to Niseko but it was super fun in tight steep trees and open, alpine terrain around Hakuba. Re: other DPS skis. Depending on your taste in skis the Lotus 120 spoon could also be an awesome choice especially if you’re into more traditional shapes. The Spoon 138’s might be a great successor to the old 138. Personally, if I make another trip to Japan I’d love to have the Spoons with me but have no experience with them yet. Regarding ski areas in Japan, I’d check out the Blister reports from last year’s trip to the Niseko area. Happy pow skiing! 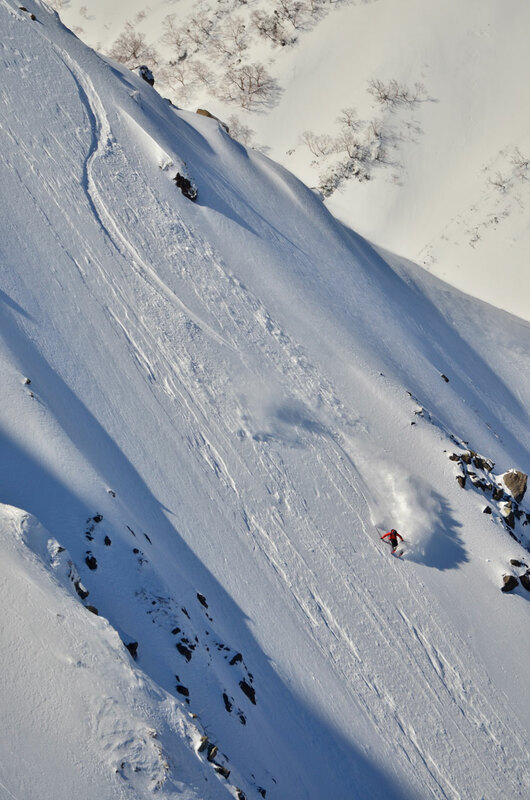 I skied in Niseko for two weeks in January 2013, and I was on the DPS 112RP at 178cm and Dynafit bindings and skied with Dynafit ZZero carbon boots. I’m 5’5″ and 140 lbs and I thought that the ski was great for the powder and everything else. It was very cold there, about 5 degrees Fahrenheit. But it is still a Maritime snowpack, just like Valdez, so the snow is cold, but still high in water content and sticky. That is what makes the amazing pillows of snow. I saw lots of DPS skis there, and many tele markers. And I even ran into the Australian DPS rep there. But I don’t think you need a super fat ski. If you stick to the resorts, the pow gets skied out quickly, so a ski that can also do the skied out stuff makes for a better day. I’m 5’10” 180 lbs. Competent advanced to expert skier, but not rad by any means. I ski fast in good snow, but dial it back in variable conditions. Only small airs here and there. Looking for a pow ski that is a bit different. Right now I have 184 112 Wailer RPs mounted tech that I use for pow touring. I have some 186 Volkl Ones mounted alpine that I use at the resort for fresh snow. Happy with both (and keeping both), just looking to try something different. I was thinking of adding a 138 to the quiver. It is sufficiently different from the above 2 skis that I don’t think there would be too much overlap. It will mostly be used for touring, as I think that’s the best way to get reliable fresh/untracked. Most of my skiing is touring nowadays (80-90%). But also would be used for any mechanized skiing (cat, sled) that I might do in the future, although nothing specific planned in this realm. I think I’d mount Beast 14s to use both touring and mechanized use. Scarpa Freedom SLs for my boot. I don’t feel like the 184 112s or 186 Ones are too short. I prefer skis around 180 for touring, maybe a little longer for resort pow, but I’ve never skied anything longer than a 187. I’ve never really felt like I’ve needed a longer ski, but maybe I don’t know what I’m missing. Especially for touring I prefer a shorter ski for tight spots, kick turns, less weight, bushwacking, etc. I was leaning towards a 182 lotus 138 spoon. Is that crazy for someone my size? Thoughts on the sizing? I am currently looking for a touring setup to explore the backcountry along i70 CO and the occasional trip to Jackson Hole. The 138 lotus intrigues me due to its light weight, float, and playful yet charging style. My question is would this ski be good center-mounted (or near center mounted)? I am looking for a playful ski to bring into the backcountry to send tricks off of cliffs and booters but would love to have the float as I am on the larger side (6ft 220 lbs). I know other skis would probably be better for freestyle but I also like to charge down the fall line from time to time so the stiffness of the ski would be appreciated. Would this be a good fit or should I be looking elsewhere? Excellent review, do you guys made a review about the 15/16 DPS Lotus 138 Spoon ?